Open beam ceiling finishes are becoming increasingly popular in new Canadian homes. The Calgary Trend House opening Monday for demonstration at 4738 Elbow Dr,. Elboya shows how some of the worlds famous Western Woods are being used in this type of architecture by leading Canadian home designers. Architect Peter Rule has designed a sturdy roof of douglas fir beams and western red cedar planking over the living room roof of his Calgary Trend House. On the inside of the living room, this roof becomes a warmly finished and attractive ceiling. The Calgary Trend House, open from April 19 to August 8 is one of 10 such modern homes being demonstrated across Canada this summer by BCs forest industries, from who’s forests and trees come western woods. Another trend demonstrated graphically by the Calgary Trend House is the increasing use of western woods interior finishes to bring warmth and contrast in modern homes with their larger window areas. Mr. Rule has thus finish the living room in the Calgary Trend House with knotty red cedar, the dining room with specialty fir plywood paneling, the master bedroom with western red cedar paneling, and the other bedrooms with Pacific Coast Hemlock planking. He has also provided homeowners with a good demonstration of the use of douglas fir plywood built-ins. These, too, are prevalent in modern planning and designed to conserve space. 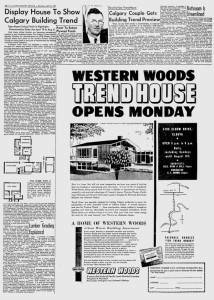 Apart from the uses in which western woods are put in the Calgary trend house, builder C.L. Brown points to the split level design and the extensive use of window glass as features of interest to the perspective homebuilder. The Calgary Trend House actually is a combination of the popular ranch style house with the split level. Advantages pointed out my Mr. Brown at the bedrooms are kept separate from the rest of the house without complete isolation and that more living space is provided without the use of an actual second story. Maximum interior lighting is provided through the extensive use of glass. Mr. Brown estimates that one third of the wall space in the Calgary trade house is taking up with glass. 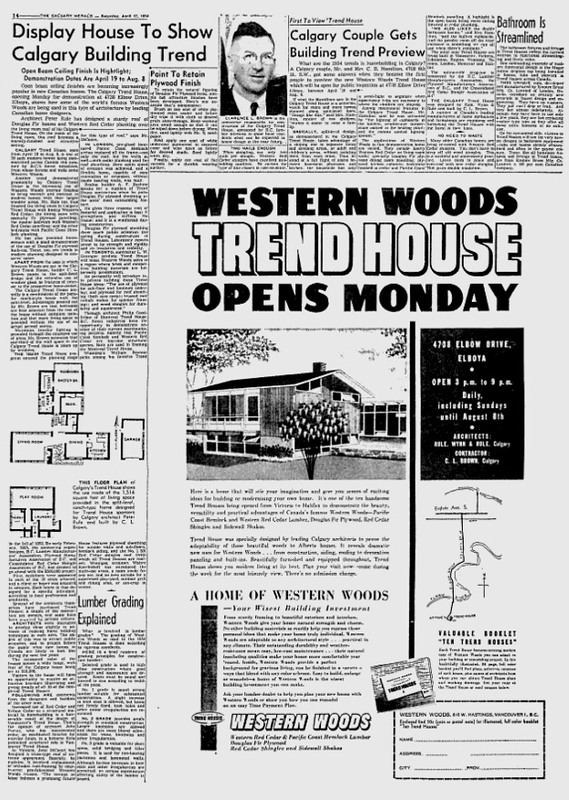 The 1953-54 Trend House program entered the planning stage in the fall of 1952. By early February 1953, the sponsoring organizations, BC Lumber Manufacturers Association, Plywood Manufacturers Association of BC, and the Consolidated Red Cedar Shingle Association of BC had decided to go ahead with the $500,000 project. First, architects were appointed in each of the 10 cities selected, and a client or buyer was acquired in advance. Each house is the best designed for a specific individual, according to local preferences and conditions. Several of the architects themselves have purchased trend houses, a couple of the contractors are owners, and some have been acquired by private citizens. Architects were instructed to develop ideas slightly in advance of existing home building techniques in each area. The object of this was to attract public attention, and to project before the public what new homes in Canada are likely to look like during the next few years. The estimated value of the houses cover a wide rage, with that of the Calgary tread house being set at $16,000. Visitors to the house will have an opportunity to acquire an attractive brochure illustrating and giving details of all 10 of the completed Trend Houses. Following are comments from the designers and builders of the other nine. Increased use of Red Cedar and yellow cedar as a structural material in homebuilding is a foreseeable result of the design of the Vancouver Trend House. That’s the opinion of architect John Porter, Who has incorporated cedar, an established favorite for the exterior finish, and a hitherto little publicized structural role in the Vancouver trend house. In Victoria, John DiCastri has designed a truss type roof of extreme appearance. Basically, he explains, it involved replacement of orthodox roof framing by easy to erect prefabricated western wood trusses. “The savings in labor indicate a promising future for this kind of roof” said Mr. DiCastri. In London, pre-glued laminated Pacific Coast Hemlock arches replace all the frame – not only the roof, but the walls as well, with cedar planking used for roof sheeting. Here again speed of a reaction was achieved, and a flexible home, capable of easy renovation or extension, without inside bearing walls, it was built. Regina builder AF Boheme speaks for a number of trend house contractors when he picks douglas fir plywood sheathing as the units most outstanding feature. He gives three reasons: cost of material and application is less; it strengthens and stiffens the frame; and it is a windbreak during construction. Douglas fir plywood sheathing drew much public attention the spring during construction of the trend houses. Laboratory reports attest to the strength and rigidity and it’s insulation instability. In Toronto, contractor L. W. Grainger predicts trend house will boost western wood sales in a region where brick and competitive building materials are historically predominant. He personally will introduce into private buildings these Trend House ideas: the use of plywood for subfloor and linoleum underlay: and plywood for roof sheathing [both save cost]: truss roof which makes for a quicker framing: and wood shingles for durability and appearance. Through architect Philip Goodfellow of Montreal Trend House, BC forest industries have the opportunity to demonstrate another of their current merchandising projects, namely that Pacific coast hemlock and western red cedar are top rated structural species. Both are used in the framing of the Montreal Trent house. Winnipeg’s William Rozmus picks among his favorite trend house features plywood sheathing for outside walls and subfloors. Hemlock siding, and the number one red cedar shingles roof [with which all trend houses are roofed] Winnipeg architect Walter Katelnikoff has introduced the multi use areas, a room inside for any use, and an area outside for a supervised play yard, outdoor grill and dining area, or sun trap in the winter.